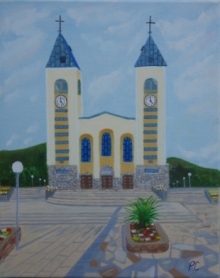 This is one of the quietest periods in Medjugorje, when there are only few smaller groups of pilgrims from Germany, Italy, the United States and Poland. On Tuesday, February 2, we celebrated the Feast of the Presentation of our Lord when seven Holy Masses were celebrated in Medjugorje, three in Croatian language. The evening prayer programme began with the prayer of Rosary, led by Fr. Hrvoje Miletic, and Fr. Danko Perutina was the main celebrant along with nine other priests concelebrating. Fr. Danko spoke in his homily about the encounter between old man Simeon and Anna, the prophetess: "The Gospel says how Simeon was upright and devout man, very honest and God fearing. We can rise the question, how come that out of so many people, even priests, it was old man Simeon who had encounter with that family. He came to the temple and he heard the voice of God because he was constantly seeking to hear it. Within himself, he was preserving the hope of coming of consolation of Israel. We, too, are invited to discover salvation, light and glory of God. God's glory, God's vicinity, God himself is revealed to us by the eyes of the faith, as our spiritual eyed can see far beyond our physical eyes. The long expected desire was finally fulfilled, Simeon became the witness, he became the prophet of God's fidelity. He did not get tired of the life he spent in prayer. It is only man who is completely turned towards God, man who is constantly in the presence of God, that is the man filled with interior and exterior joy. Besides old man Simeon, there was also the prophetess Anna, who accepted her hard life of a widow without mourning and bitterness. She represents all those devoted people“, said Fr. Danko and reminded us all that we are now in the year of Mercy: „As we are now in the Year of Mercy, let us remind Jesus to reopen the eyes of heart and the eyes of our soul, so we can recognise Him in every human being we encounter, so every time we come to the Holy Eucharist, He may inflame in us the fire of His love. We will be able to do so only if we pray. Gospa invited us to prayer so many times here. Let us answer tonight that call, call of Jesus, call of our Church to pray in the morning and in the evening, to pray as a family, so we would become genuine witnesses of God's love in this restless world”.